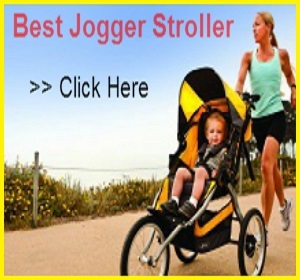 There are numerous strollers for parents who love to jog. Want about for those who bike? Well there are top class bike strollers for them too. Having children does not mean that your hobbies or health should take a back seat. In fact newer ways are being found to incorporate these along with the time you spend with your children. 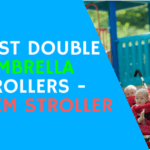 Strollers are one of the most innovative designs that not only help you to spend time with your children but also maintain your health and also make you step out of the confines of your home. Bike strollers are designed by a handful of companies. 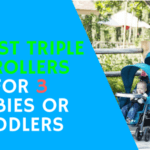 What I have done is that I have incorporated the top ones in this list (5 Best Bike Strollers for Babies ) . I always urge my readers to do more research if they feel they are not satisfied. Enjoy reading. Built for one or more children, the Burley Design Bee Bike Trailer is also lightweight. 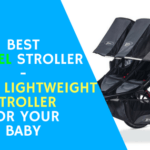 Keep on reading to know more about this budget friendly stroller. 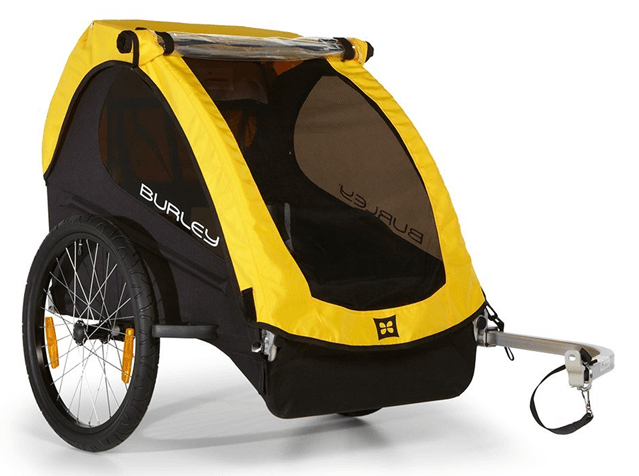 Firstly the Burley Design Bee Bike Trailer features 20: push button wheels for easy removal. There are wheel guards that protect from unforeseen obstacles. The side battens create structured barrier between wheels and passenger. The bike stroller is 30” wide so you should have no problem in maneuvering through doorways. Also since it is lightweight, it is easy to maneuver the stroller on all surfaces. 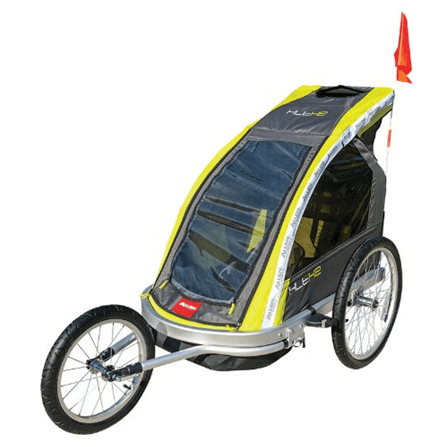 The stroller is designed ready to bike and includes a hitch, tow arm and safety flag. Once you buy it you are ready for an adventure with your children. At 19.5 pounds this sure is a lightweight stroller. The stroller has weight bearing capacity of 100 pounds. The Burley Design Bee Bike Stroller has a compact fold that flattens it and makes it easy for transportation. 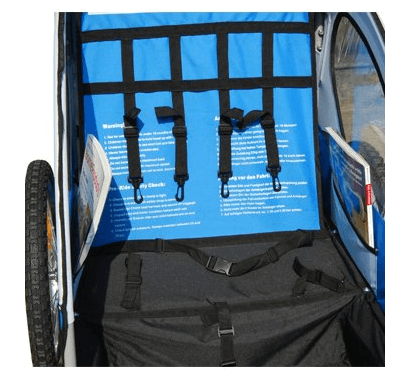 The front to rear fold increases the safety and durability of the stroller. The Burley Design Bike Stroller has designed and tested to meet or exceed ASTM F1975-09 safety standards. The Flex Connector allows bike to lay flat while trailer remains upright. It has a five-point harness system that makes sure that your child is strapped in safely. The roll cage is full aluminum for protection. The stroller also has reflective materials and reflectors for visibility. There is also Safety flag for visibility. The large cargo area is more than sufficient to keep essentials for both your children such as diaper bags, snacks, clothes, toys among other things. Also there are interior pockets in both cargo area as well as seating area. O storage options are more than sufficient in this stroller. The seating in the Burley Design Bee Bike Stroller is hammock style and there is recessed helmet pocket for extra head room too. The rear and side windows are tinted in order to protect your child from the harmful rays of the sun. There is also rear window ventilation so that your children feel comfortable. UV protection windows are rated UPF 30 and block 96-97.4% of UV light. It comes with a rain cover to keep passengers dry during rains. All in all the Burley Design Bike Stroller is a budget friendly stroller that can hold up to two children comfortably. The best part is the safety standards that are top class. You can know more about this stroller and even order it online from Amazon. 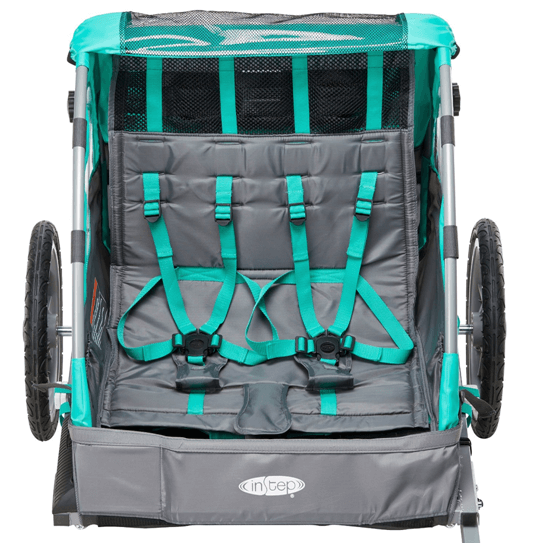 Another budget stroller, the Thule Cadence has made a name for itself in the bike strollers market. 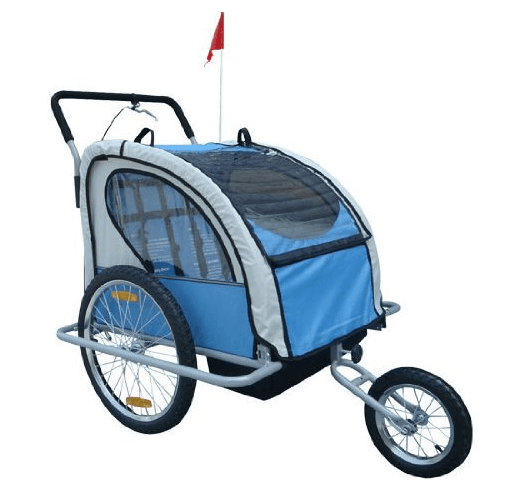 This easy to use bike trailer has several features that are unique to it. Scroll down to know more about this stroller. Firstly the Thule Cadence has secure attachment to bike using Thule’s patented ezHitch. 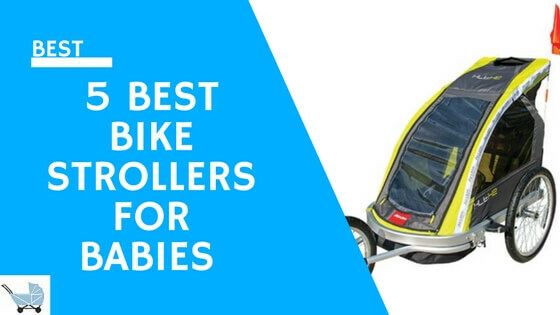 This assures that the stroller is securely and safely attached to your bike. The width of the stroller is 30” and weight 22 pounds so maneuvering this stroller I a piece of cake. You will not feel it dragging when attached to your bike. In fact it will feel like a part of your bike. The wheels can be easily removed for an easy fold. 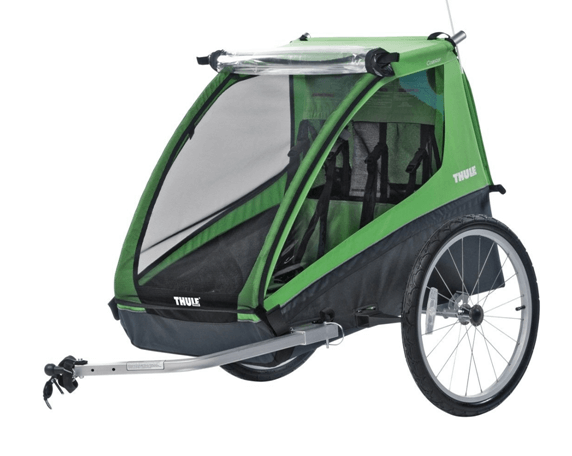 Thule Cadence has a weight of 22 pounds which is a medium weight range. It has an easy fold for storage and transportation. If you are planning an adventure with your family then you can easily store this stroller and be ready for an adventure. The ezHitch makes sure that the stroller is safely attached to the bike. This patented technology assures top class safety for your children. It also meets international safety standards. The cockpit is made from climate controlled material thus making it comfortable for your children. 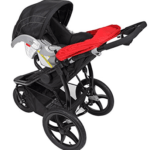 The material used in the stroller is top class, stylish and durable. There is an extra large storage space to keep cargo. All your children’s essentials can be easily accommodated in the cargo space. The seat is comfortable. It has a roll down rain cover and side vent for your child’s comfort. 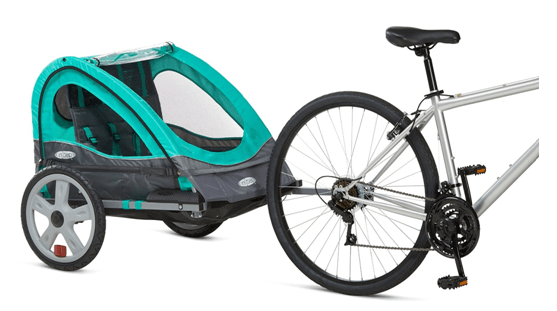 Also the stroller comes with a Bicycle Trailer kit. 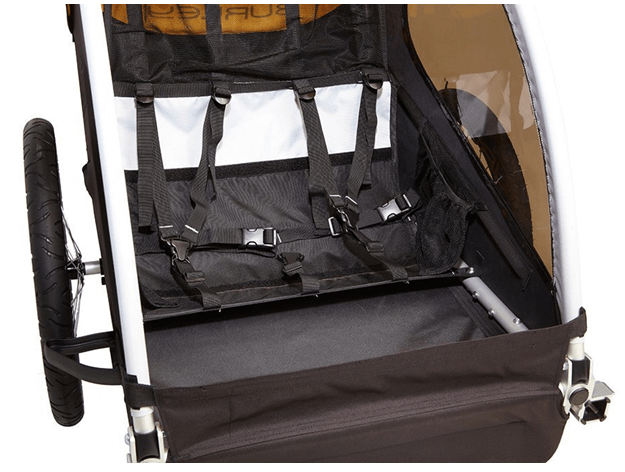 A simple yet effective stroller, the Thule Cadence meets the basic purpose. If you liked the stroller then you can order it from Amazon in a jiffy. InSTEP Quick N EZ Double Bicycle stroller is a low budget, top quality, feature packed stroller. This trailer offers maximum family fun when you are out on an adventure with your little ones. Keep on reading to get yourself acquainted with more features about this stroller. The wheels in the InSTEP Quick N EZ Double Bicycle have 19” pneumatic tires with molded rims that increase performance and are also stylish at the same time. It also has a versatile bicycle coupler that attaches to most bicycles. It also includes a stroller kit with swiveling front wheels, parking brake and a handlebar. It also has a quick release wheel for a compact fold. The InSTEP Quick N EZ Double Bicycle weighs around 25 pounds at shipping. It is not a bulky stroller and you will enjoy biking with it. It can take a maximum weight of 80 pounds which is a good number. It has a unique folding frame that is space and time saving. It enables you to easily sore it and also for transportation. The InSTEP Quick N EZ Double Bicycle meets required safety standards. It has a 5 point harness and shoulder pads. Material used in the stroller is top class. It is safe and durable. The large storage space is more than enough to store your child’s essentials such as clothes, diaper bags, snacks and toys. The seat is comfortable in the InSTEP Quick N EZ Double Bicycle. 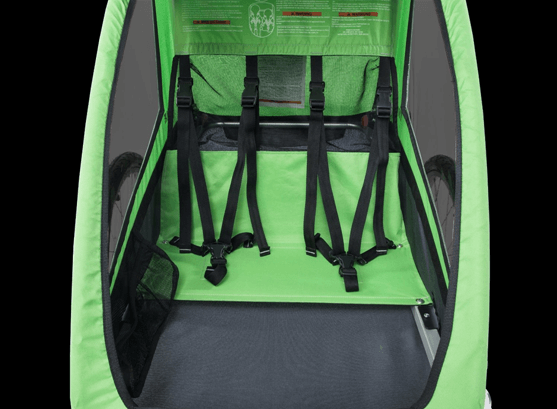 The 2-in-1 canopy includes a bug screen and weather shield to protect your child from natural elements. The roll down weather shield is easy to put in place when required. All in all the InSTEP Quick N EZ Double Bicycle is a budget friendly stroller for those who are on a budget. It has almost all features that a high budget stroller has. So, if you want to buy this stroller log on to Amazon right now. 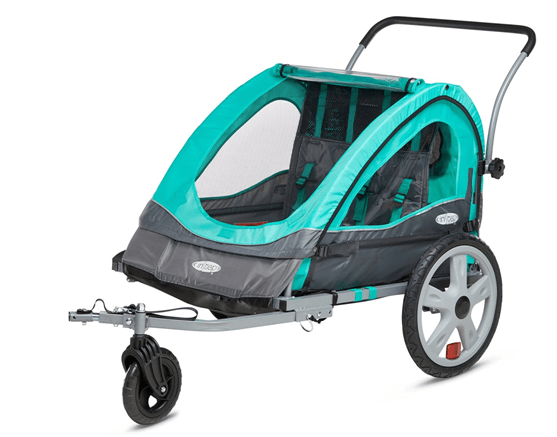 Allen Sports Premier 2 Child Jogger/Bike Trailer is a budget friendly stroller that offers best features and top class safety. It can be easily converted from a jogging trailer to a bike trailer in a jiffy. Scroll down to know more about this stroller. The wheels are 20” rear wheels and 16” front wheel. It includes safety flag for trailer mode. 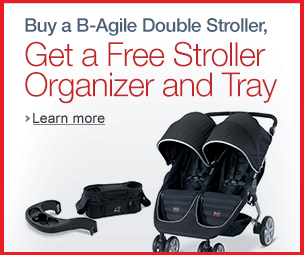 Also it features easy and quick snap together frame that enables you to put the stroller together in no time. The wheel is fixed and allows more stability. The trailer has a foot guard tube to protect your child’s feet. Maneuvering it is a piece of cake. The wheels can be quickly released with a push button thus making it fold more compactly. It comes with a universal coupler that attaches itself to most bikes. The trailer also comes with frame mounted parking brakes. 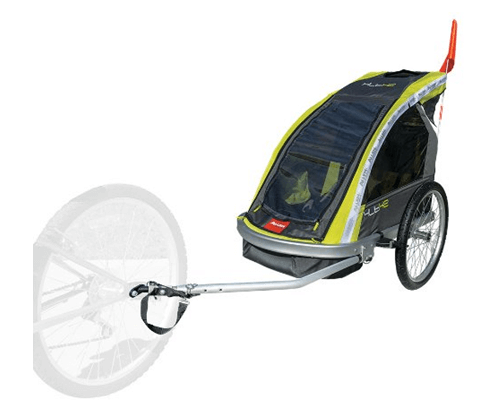 Allen Sports Premier 2-Child Jogger/Bike Trailer weighs around 30 pounds and s not heavy when attached to a bike. You will not even feel the weight while jogging too. It can hold up to 100 pounds. It has quick fold design that makes it easier for you to store. Firstly for safety the trailer includes a safety flag for trailer mode. The trailer meets ASTM standards for safety. The 5 point safety harness for both children straps your child in safely. The trailer is light weight aluminum. IT is sturdy and durable. Allen Sports Premier 2-Child Jogger/Bike Trailer has a rear storage option that is more than sufficient to keep essentials for two children. The trailer as a capacity to seat two children. The 24” cabin is roomy with wide side windows so that children can enjoy the view. The trailer has a zipper release three season rain and bug sheet. The zipper has more durability as compared to Velcro. 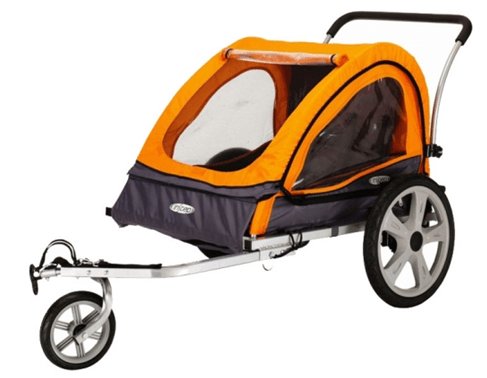 Allen sports premier 2Child Jogger/ Bike Trailer offer a while range of features at a great price. Order this trailer now from Amazon. The Aosom Elite 2in1 Double Child Bike Trailer/ Jogger can be easily converted from a jogger to a trailer in a jiffy. 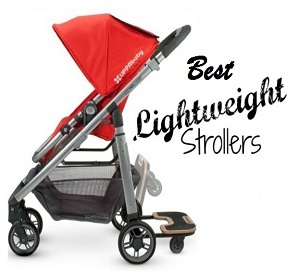 With host of other features this low budget but top quality stroller surely deserves attention. Read on to know more about it here. 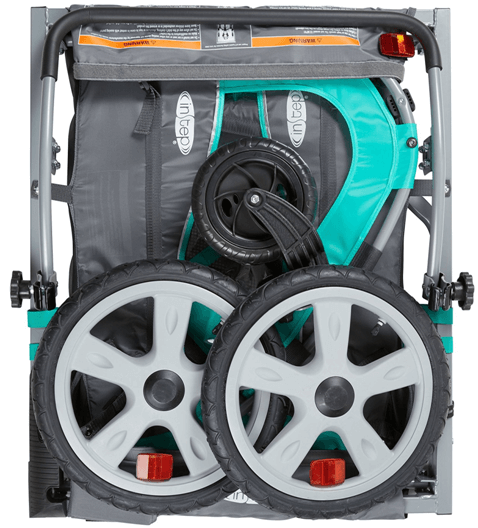 Perfect for an adventure, the Aosom Elite 2in1 Double Child Bike Trailer/ Jogger is built for both jogging as well as cycling enthusiasts. The front wheel is fixed for safety and comes with an all suspension in order to give a comfortable ride to your children. The lightweight all steel frame has smooth-rolling 20″ wheels for traversing uneven terrain. The front wheel is 12”. It can be easily converted to a bike trailer and the conversion kit is included in the packaging. The hand-lock brake system on the rear wheel allows you to lock the jogging stroller while it’s parked. A bike hitch/coupler is included for connecting the trailer to the bike. It even fits a bike with quick-release wheels. The trailer can hold up to 88 pounds and has a quick and easy fold. You can easily store it and is perfect for transportation also. The trailer meets the required safety standards. The hand lock rear wheel brakes are added safety features. Also the 5 point harness and the front fixed wheel add more safety. The material used in this trailer is top quality and is durable. The frame is all metal hence will last longer than other trailers. Aosom Elite 2in1 Double Child Bike Trailer/ Jogger have ample storage to keep all required essentials for two children. From diaper bags, to clothes, to toys, you can fit in everything in the cargo area. It is a two seater trailer and is in fact quite roomy. Both your children have enough leg space inside the trailer. The rain cover is perfect for those rainy mornings when you want to go out. Aosom Elite 2in1 Double Child Bike Trailer/ Jogger is a great stroller with a great price. With excellent features you can use it for two children. If you are interested in buying this trailer then log on to Amazon now. 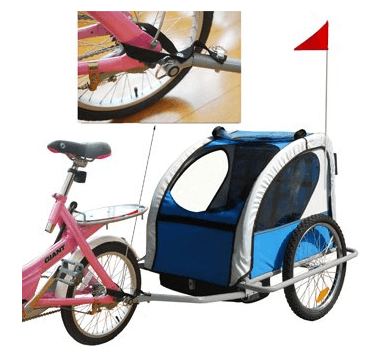 Bike Trailers are easier to buy as compared to other strollers. Bike trailers that are used as joggers are excellent. You get to have two options at the price of one. I love bike trailers because two children can easily be accommodated in the cockpit and the trailer can be easily attached to the bike. Also they are far cheaper than your normal strollers. Hope you enjoyed reading. Good luck with your stroller hunting. 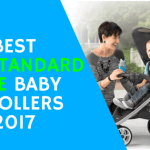 I hope you liked this 5 Best Bike Strollers for Babies article . Kindly share with your friends and family.